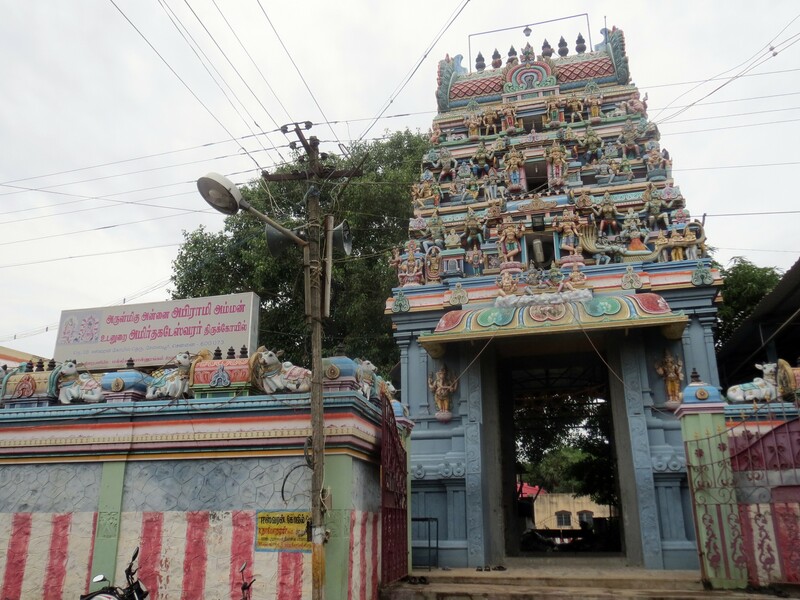 This is the 68th Shiva temple on the southern bank of Cauvery praised in hymns. The temple is facing east with compound walls and entrance at the front. It has a 3 tier Rajagopuram and a brick mandap of Naicker age. Ambica shrine is in the north of this mandap facing south. North of the Maha Mandap are the shrines of Lord Dandapani-Muruga in a small size and Lord Nardana Vinayaka on the south. Nandi Bali Peeta is in the front mandap. During the great destruction-pralaya, a pot-Kalasa containing all lives stayed in this place, hence the name Kalayanallur, according to sthala puranas. Lord Brahmma had worshipped Lord Shiva in this place. Also this is the place where Lord was pleased with the penance of Ambica and wedded Her. This event is shown in a sculpture. Lord Dakshinamurthy adores the temple. Lord Lingodhbava is of emerald stone. Lord Arthanareeswara is seen with His right leg in a relaxing posture. Ambica stands facing the Lord. People pray for various wishes. Mela Kadambur Amirthakadeswarar Temple is a Hindu temple located at Mela Kadambur in Cuddalore district of Tamil Nadu, India. The historical name of the place is Tirukadambur. The presiding deity is Shiva. He is called as Amirtha Kadeswarar. His consort is known as Vidyujothi Nayaki. The temple has beautiful sculptures and the vimana is in the form of a chariot. It is one of the shrines of the 275 Paadal Petra Sthalams - Shiva Sthalams glorified in the early medieval Tevaram poems by Tamil Saivite NayanarsTirunavukkarasar and Sundarar. Sangamangai near Kancheepuram is the birth place of Sakkia Nayanar born in the month of Margazhi (December-January) on a Pooradam star day. He was attached to Lord Shiva and his devotees with the staunch faith that Lord Shiva alone can help a soul to cross the ocean of life. Though appearing in his Sakya style (Sakyas do not belong to Saivism and had a type of dressing different from Saivites) Lord Shiva was ever in his thoughts. He was doing Shiva Puja secretly without anybodys knowledge. While Nayanar was out on a day, he found a Shiva Linga lying uncared for. He wanted to clean the Linga with abishek, garland and worship but there was nothing for the purpose. Yet Nayanar took a small stone considering it as a flower and placed it on Him chanting the Shiva mantra-Nama Shivaya. What fell on Lord was not the stone but a flower. The stones used for the puja fell at the feet of Lord Shiva in Mount Kailash. He gave darshan to Nayanar with Mother Parvathi. As Sakkia Nayanar worshipped Lord Shiva here, the place is known as Sakkottai. Maha Shivrathri and Masi Magam in February-March and Margazhi Tiruvadhirai in December-January are the festivals celebrated in the temple. 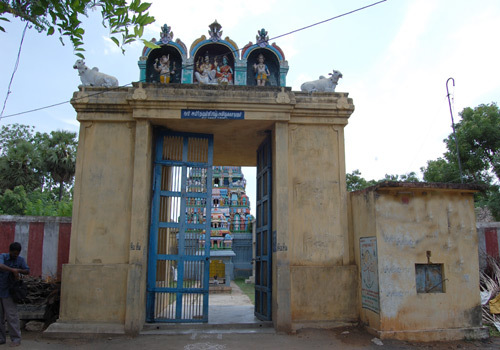 Kaarai tirunatheswarar Temple, Thirukkalimedu, Ka..
Sri Sivakozhundeesar Temple Tiruttinai Nagar, Cud..